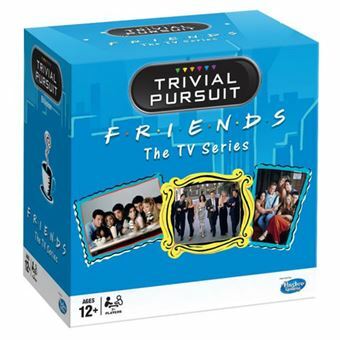 This bitsize version of trivial pursuit comes in a wedge-shaped box and includes questions about the TV show "Friends". The game consists of 100 cards, each with 6 questions and answers taken from different seasons. The game also includes a die that is rolled to determine which season the player must answer a question from. Jogo bastante incompleto para o preço cobrado. Tem um baralho de perguntas, uma "rodela" para colocar os queijinhos (que não vêm), o tabuleiro tambem não vem.